After months of searching and reading, I'm ready to begin. I guess this is less of a "build" and more of a progressive replacement of parts. I was looking for a forged pre-ban receiver, and found a complete pre-ban rifle for roughly the same price ( ). Instead of creating a bijillion posts to clog up the forum, I figured I'd start this one and then post along the way. Everyone has been a huge help so far, and I hope to get your continued advice as I go along. So...my first question. 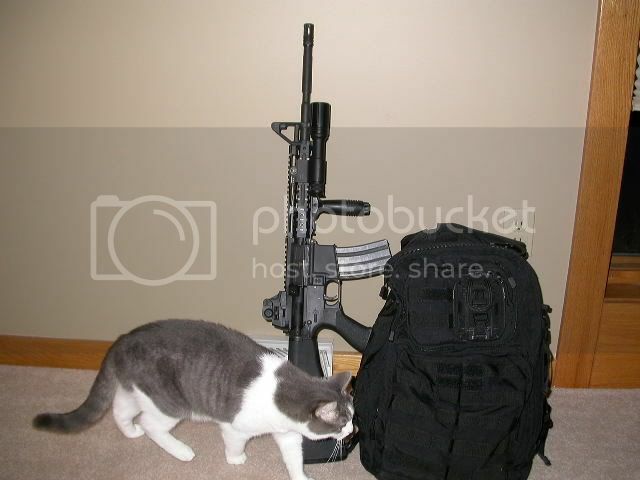 Does anyone know what sort of finish is on the rifle? It's an Eagle Arms 20". AFAIK (or thought I knew), lowers are generally anodized, and steel parts are parkerized. I've also heard about parts being phospate finished, but from the searching I've done, that seems to refer to parkerizing? This one, however, looks quite different from friend's AR's. It's somewhat gray as opposed to black. And the grain of the finish on the bbl looks closer (more smooth) than most others I've seen. So...I'm hoping someone knows for sure. The first thing I want to do is replace the upper, and I'm sure it's going to be impossible to match the gray. Anyone own a grayish receiver with a darker upper? Would love to see some pictures. Eagle Arms is good stuff. Enjoy your project. 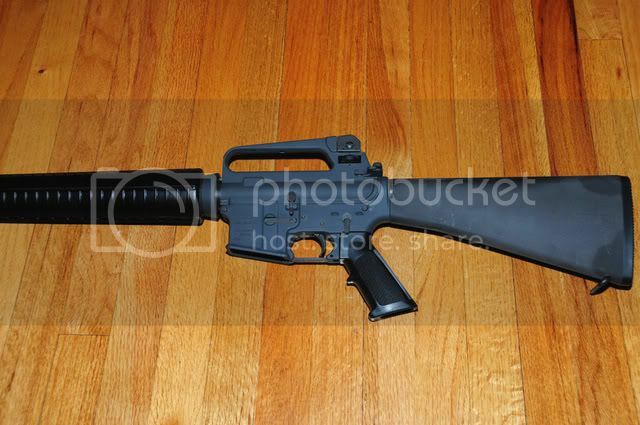 You might want to build a separate upper, maybe a carbine, and get a collapseable stock. In case you want to change down the line. Just buy whatever upper you desire, and duracoat both upper and lower recievers to match. Works every time. Anyone own a grayish receiver with a darker upper? Would love to see some pictures. The bottom is a grety colt and the top is a black lmt. Not that obvious in that picture. you know what...I think I like the gray receiver with a black upper...especially with all bacl trip, pins, etc. Plus, if I don't duracoat it, it will still match the original upper. I think I'm going to leave it for character..
Bump––can anyone confirm what finish I have on the lower (gray anodizing?) and on the upper (also anodizing? or is it steel?). 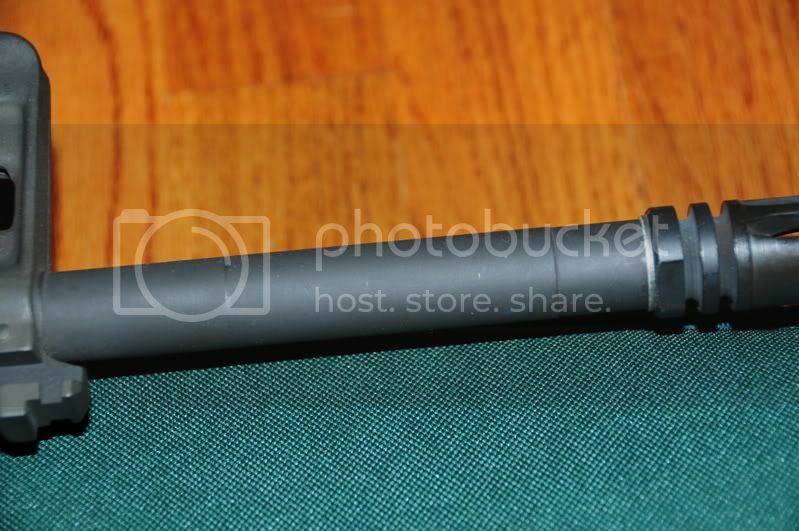 Last, I included a picture of the barrel. It's not bare steel, but the coating seems to be very thin––wondering what it was. It doens't look like the parkerization done on other ARs I have seen. Is parkerization the same as phosphate finish? Sorry about all the questions––trying to pick all this up as quickly as I can. Thanks!